Around here, by the time mid-April rolls around spring has been underway for a couple of months. February usually kicks off spring with the early spring blooms like the crocus and daffodils. So by now, all the bulb blossoms have bloomed and faded leaving the stage free for the flowering shrubs and bushes to put on their show of the season. Although I greatly anticipate the sprouting and blooming of the bulbs, I always look forward to this time because the profusion of color is no longer close to the ground but is up at eye-level (sometime higher), and the garden is ablaze with its springtime palette. Even at a good distance, one can appreciate and enjoy the spectacular display. Even small blossoms like the tiny Breath of Heaven (left) can't be missed simply because of their sheer quantity. Breath of Heaven bushes can get quite large in our zone. I planted ours in the spring of 2001, and it's already about 5 feet tall and almost as wide. In the spring breezes, the whole giant orb of light and delicate branches sways and "dances" to a silent melody. Another spring favorite at this time of year, are all the insects that are out and about in the garden doing their job and keeping nature in balance. I'm always happy to see little critters wandering around the blossoms laden with pollen like the bug on the Lilac Hibiscus (above left). I am also always pleased to see my good friends, the ladybugs, wandering around throughout the garden. As I go about my garden chores, I watch for flashes of orange so I don't harm any of these helpful little ones when they happen to be somewhere I don't expect them--like sunning on the garden hose (above right). The roses are all putting on their first big show of the year. The climbers that I planted in 2006 along the southwest fence of the back garden are quite happy in that sunny location. Despite the summer heat, they fare very well with just a dripper a piece at their bases to give them water. Right now, their deep roots are still enjoying the benefits of the winter rains. The Joseph's Coat (above left) is just one of 7 rosebushes growing along the fence. 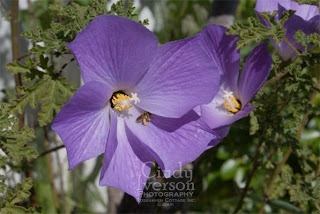 Of those 7 bushes, 5 are covered with blooms right now which I can see just outside my studio window. I am happy to report that the plum tree is still covered with little green plums. This will be the first true crop I've had in about 3 years, and I'm tickled to death about it. We did have some 40 mile an hour winds two days ago that knocked a few off the tree (I was very sad) but there are still enough left that I should be able to enjoy fresh juicy plums in a few months as long as nothing else comes along to disturb them. 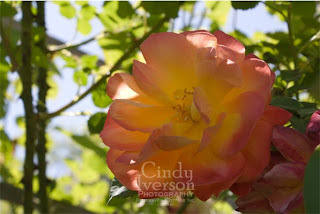 And finally, a spring favorite that never really stopped putting on a show--my pink mystery rose. Planted here long before we came to live at Rosehaven Cottage, this bush was cut to the ground when we bought the house, and I finally discovered it as the garden started coming back to life over the first couple of months. I soon discovered that its a climbing rose that needed a trellis. I found a nice craftsman-style trellis for it shortly after that discovery, and its been a very happy rose ever since. 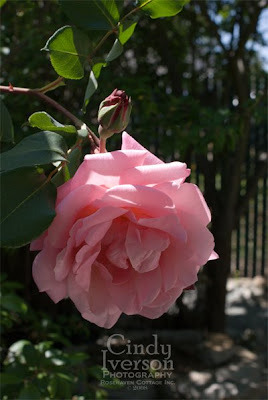 Like most roses, it likes to be trimmed and pruned vigorously and always thanks me with these amazing pink blooms that are often 6 inches in diameter when full-blown. 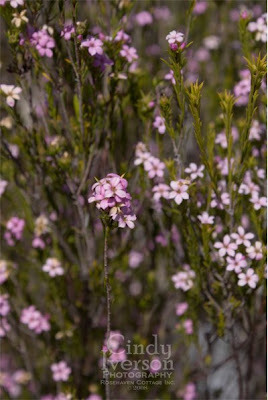 It has a nice traditional scent and is amazingly disease resistant. Anyone want to hazard a guess as to what variety it is? I have yet to figure it out. And that's my spring favorites... for now anyway. I can guarantee that in the next few days, I'll find something else that qualifies as a "favorite" too. This rose is perfection. So delicate. Very nice, Cindy! We're a long way from roses (naturally) but I sure enjoy seeing yours. Running a little behind here again due to deadline committments, but always happy to see new posts at Rosehaven. What beautiful roses. Mine are in full bloom here in N. Tx. That is a beautiful rose! 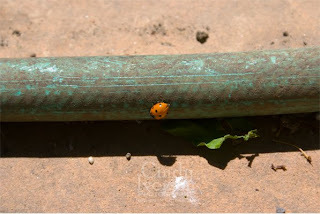 I'm already spotting a few lady bugs here; it is always good to see them. Just stopping by after too long away from Blogland, doing much needed visiting and updating my blog. I have been crazy busy and just now back to visit. I love how much your garden has changed in the past couple of weeks! A mystery rose, what a wonderful surprize! Pink, blue, and Lavender are my favorites in the garden. We had a hail storm yesterday and I was amazed that it didn't pummel my flowers. You must have quite a gorgeous view of all those blosssoms outside your studio window, Cindy! This is a wonderful, happy and contented post, and you have conveyed the beauty of your little homestead at Rosehaven Cottage, quite well! This has to be the best part of the year, everything is so fresh and growing by the minute, I'm sure if it's quiet enough you can actually hear the plants growing.Looks like all your hard work has paid off as your garden is looking wonderful.